For the blog readers, a caveat to 'how we met' by Keith (this is Linda). I was not looking. I did not knowingly BDD. He claims I took over, but as I recollect things I was surprised to discover he was interested & any BDD was done by Keith. He might say that just means I was so good at it I got him to do all the work:) However it happened it must have worked, because we have been together over 30 years & will celebrate our 29th year of marriage this coming Sunday. Yea us! You made him cookies Linda! If that isn't an outright BDD manoever I don't know what is... tee hee. Curtis is seriously cute. There is nothing better than cat bellies and purring!! There is magic in those vibrations I tell you!! Such great answers Keith! 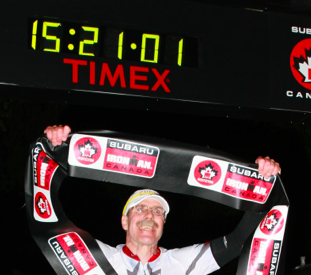 You know there is a half at Challenge Penticton now in case you ever have a hankering to go back there. That picture of Curtis!! He's so adorable! Oh, and happy anniversary!! 29 years! !